Everyone knows about the fun that can be had in Death Valley National Monument, but few realize that the fun isn't bound by its borders. We decide to explore the lesser known area around Death Valley. Who knows what we may find? Actually, we heard of a place called Spooky Canyon. Naturally, we had to find out if it was as spooky as the rumors indicated. This miniQuest trip will require a bit more travel than most since we must pass through Baker before the off-roading begins. We plan to head out around 8:00am, but actually leave around 8:20. Ted is anxious to leave, so he heads out first. He zooms ahead so far that he is soon out of radio range. We'll meet up with him in Baker, we hope. The group poses for a picture. Ted is anxious to leave and is waiting in the car. You can see him in the background (Ned is outside the car, waving). World's tallest thermometer! If you look closely, you can see the temperature is already 87 degrees. We arrive in Baker and stop for lunch. Conveniently located at the base of a rather large thermometer is a visitor center. It is here that we learn about the Mojave National Preserve. Mojave National Preserve protects 1.6 million acres of diverse desert landscape, supporting many ecologically significant plants and animals. Sand dunes, ghost towns, volcanic cinder cones, historic mines, mesas, railroads, ancient trails, and mile high mountains define Mojave's age and character. Explore the park safely. Few facilities and services are available within the preserve's boundaries; water is scarce and there are no restaurants or gas stations. Enjoy your visit, but be prepared for the climate extremes of this desert environment. This is Emerald Grotto. The grotto was filled with green emeralds or at least bright green rock. This is a "cairn". It looked just like a "pile of rocks" to us, but Colin ensured us that it was a cairn. The grotto was filled with green emeralds or at least bright green rock. A flash of green over a hill and we were compelled to stop and explore. The green was from a grotto filled with green emerald-like rock. The rocks were greener than a really green thing. Jumping out and exploring revealed even more green rocks. Matt was excited to find some other stuff as well. He was so proud. It was then that we notice this grotto was marked by a "cairn". Colin informs us that a cairn is a pile of stones used as a marker. Armed with this knowledge we proceed onward. The "Crucifixion Bush". It grows wild in two spots. The Middle East and on a secluded dry lake near Afton. A flying dragon (a.k.a., dragonfly) perched over us. The creature is hard to see, so we point it out in the picture. After only a short distance we discover a small secluded dry lake and a patch of strange plants growing around it. It turns out these plants are called "crucifixion bushes" and are the same plants that were used to make the crown of thorn Christ wore. How did these plants get here? The only other place they grow is in the middle east. This is a mystery we wanted to explore. So we did. Matt was excited to find some thorns. Matt is good at finding things. He was so proud. The rest of us had to settle for finding things that were interesting. Things like a flying dragon, seed pods, a giant spider, and an Indian campsite. 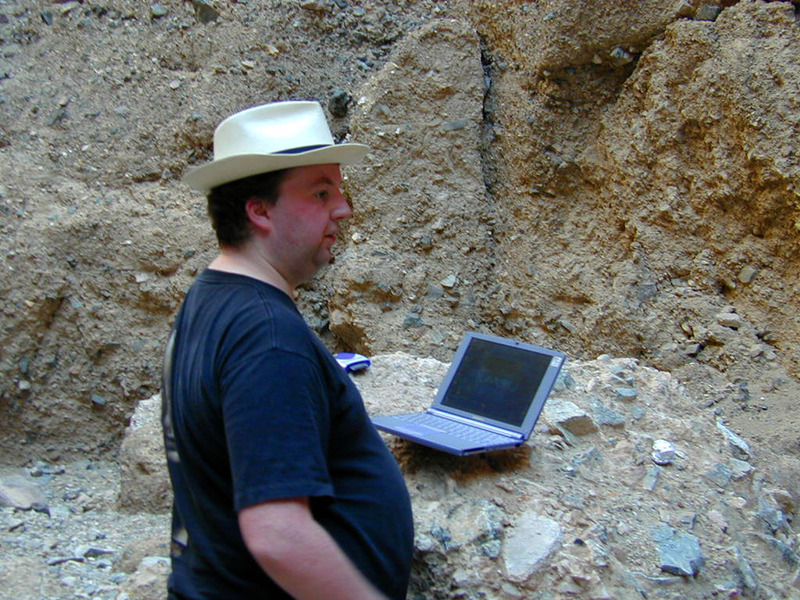 After defiling down several layers of rock, Mike finds a bottle with a note. The grave of Bonnie Keebler Harris. 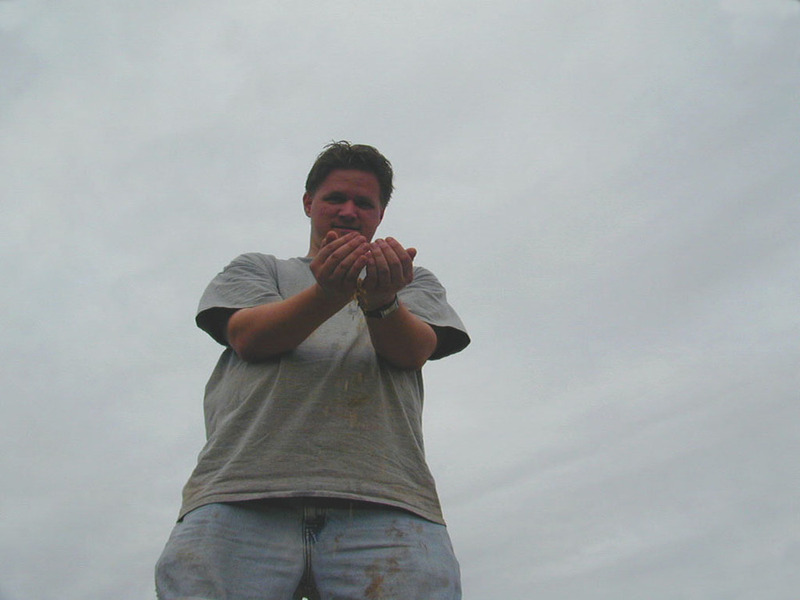 This picture was taken before Mike started to dig. The discoveries didn't stop there. We soon find a cairn! Actually, this cairn turned out to be a grave. Who's grave is this? Is there a story behind it? The answer lies within -- literally. Mike discovered a note in a bottle under the stones. The grave belonged to Bonnie Keebler Harris. She died in 1872. At last, an undeniable piece of real live history. Ok, well 'dead' history, but you get the point. This was quite enough history for one spot I thought, so before Mike could dig any deeper, we decided to head out. Dec. 27, 1872 To whom it may concern, Died this day of sickness. Too far to travel so will put her here. Mrs. Bonnie Keebler Harris, Born Dec. 1823 in New York. Mother of five children. "God Rest Her Soul". Crossing the Mojave River. That is real water, but it is not real deep. The next stop was Afton Canyon. 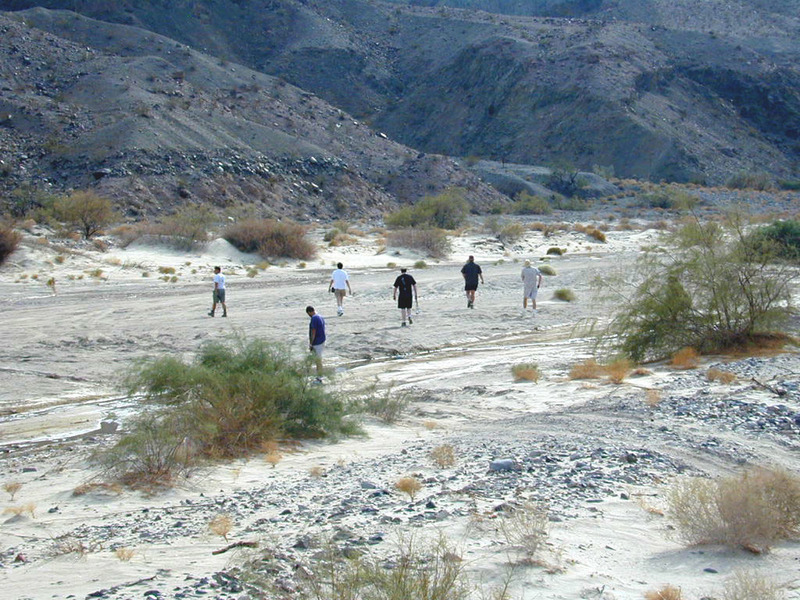 Entering the canyon requires crossing the Mojave River! Fortunately the river wasn't terribly deep (probably low tide). With enough speed we were able to cross. A short distance beyond we cross under a railroad bridge. The map indicates that caves are nearby. These caves used to serve as a wagon stop for weary travelers. We will stop too. The wagon stop cave. Ted explores the ant lion traps that cover the cave floor. The roof was covered in soot. Evidence of many wagon campouts here. Everyone begins to hike downstream. After a quarter mile or so we reach the caves! The cave we enter is not very large. Probably large enough the shelter a couple of wagons. The roof of the cave is covered with soot, indicating frequent use. The floor of the cave is covered with ant lion traps. It was then that I discovered a "cairn". As we learned at the Emerald Grotto, interesting (non-sucky) places are marked with a cairn. If only Matt had seen the cairn, he would have realized how fascinating this place was. We couldn't stay here listening to Matt's commentary forever. It was time to continue down the Afton road to see what we could see. The Afton road paralleled railroad tracks. The road followed along side a railroad line. This railroad was a mixture of old and new. The old was manifested in the power poles that paralleled the track. These power poles mounted ancient blue insulators -- an antique collector's delight. 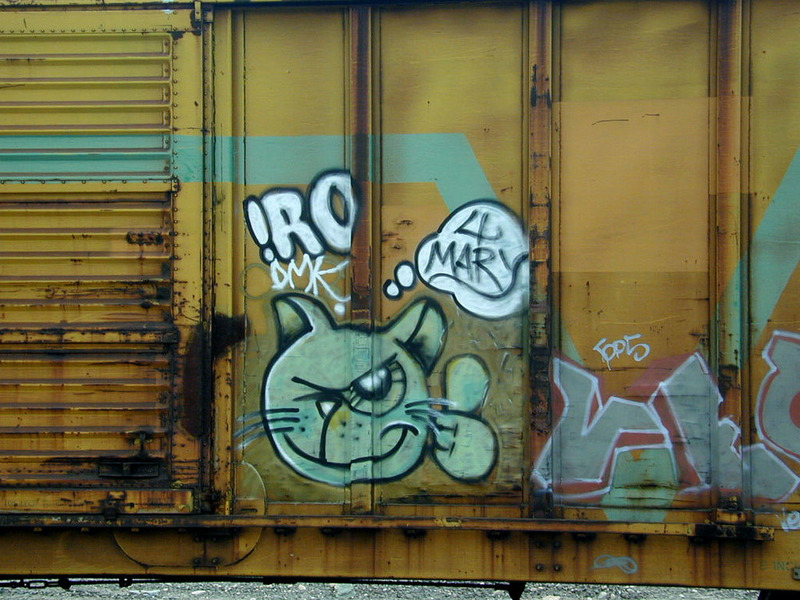 The new was manifested in the railroad. The track was held down by concrete railroad ties and paper clips. Although we followed the tracks for quite awhile, no trains came by. Strange. Another strange sight was the rock formations along the canyon walls. The walls were covered with deep crevasses. Each crevasse was like a mini-canyon extending into the rock wall. Deep crevasses along Afton canyon walls. Initially, the canyon floor was not cramped and there was plenty of light peeking down from above. A cairn. This is a good sign. A cairn marks a fascinating location. Ned and Matt return from the nether regions of Spooky Canyon. One can always find use for a computer. Here Colin downloads some pictures to the computer for a little slide show. What is this to our left? A deep crevasse, big enough to hike into! We stop, get out, and explore this spooky looking canyon. In order to enter Spooky Canyon, we crossed under a small railway bridge. The bridge was labeled 194.65. The canyon walls were very steep and very high. The sky could be seen and travel was not difficult. The farther we went, the taller the walls and the narrower the path became. It was then that we discovered a cairn! Yes, this is a good sign. The walls got taller and closer together. So tall and close that they began to touch over our heads. The path got so narrow that it was wide enough for only one person to pass at a time. If that wasn't enough, the light vanished and flashlights were needed. Was this safe? Would it rain and flash flood fill the canyon? What was that sound? It was spooky. Eventually the path got so narrow and steep that we couldn't proceed. Well, most of us couldn't proceed. A few adventurous members of the party trooped on while the rest of us turned back. After many hours they returned with stories of endless twisty tunnels, cliffs, and a climbing rope. Although we traveled quite a way before turning back, they informed us that the spooky canyon went on much farther. Even they were unable to reach the end. 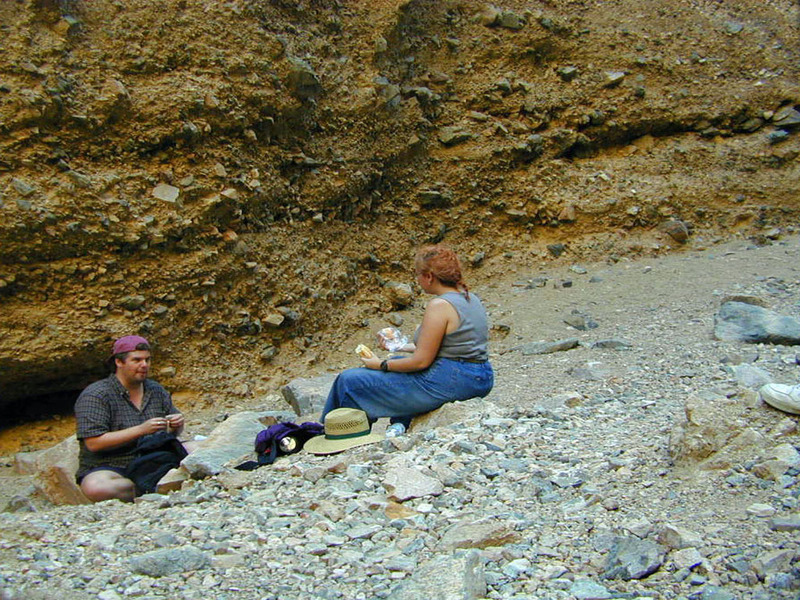 After we reach the entrance to spooky canyon, we stop for lunch. There is much more to see, so we don't delay here long. Well, long enough to break out a laptop computer! Everyone mounts up and we continue down the railroad line. Railroad car wheels should be right here where this telling hole is. Ned explores the strength of railroad car. Can it hold a person's weight? Apparently so, but there was a hole in the top. Looks like someone tried to dig out the railroad car! This place must get very muddy when it rains. We have a map that indicates a buried railroad car nearby. After almost passing it, we find the spot. Yes indeed, a railroad boxcar appears to be buried up to the very top. That must have been some flood to do that. The map also indicates some buried railroad car wheels nearby. 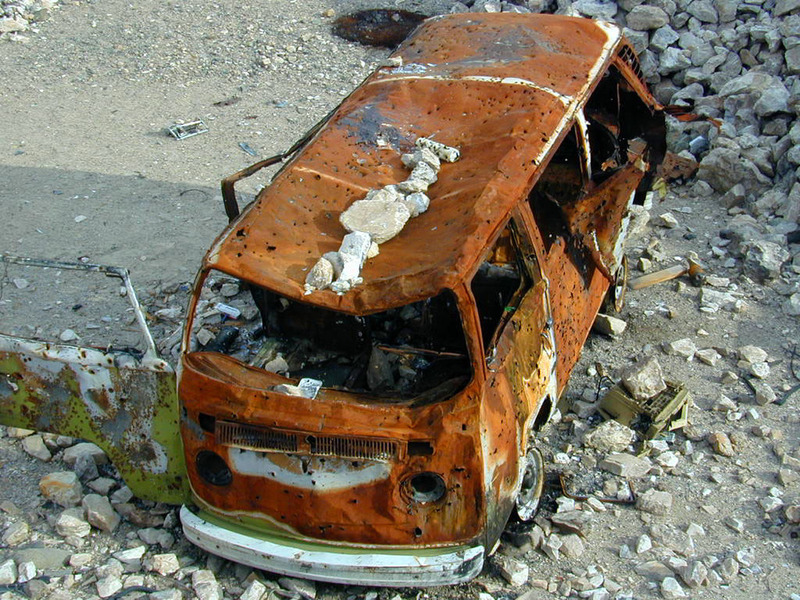 After a thorough search we conclude that the wheels have been removed. A suspicious hole right where the wheels should have been is a powerful clue. It also appeared that someone tried to dig out the railroad car as well. Fat chance. All they left was a hole with an interesting mud texture at the bottom. There were several other pieces of railroad debris here, but we left them. Taking railroad debris would be like vandalism. None of us would do that. Or so I thought. Following down the mine cart tracks. The retaining wall is in remarkable condition. Ned practices for the circus. 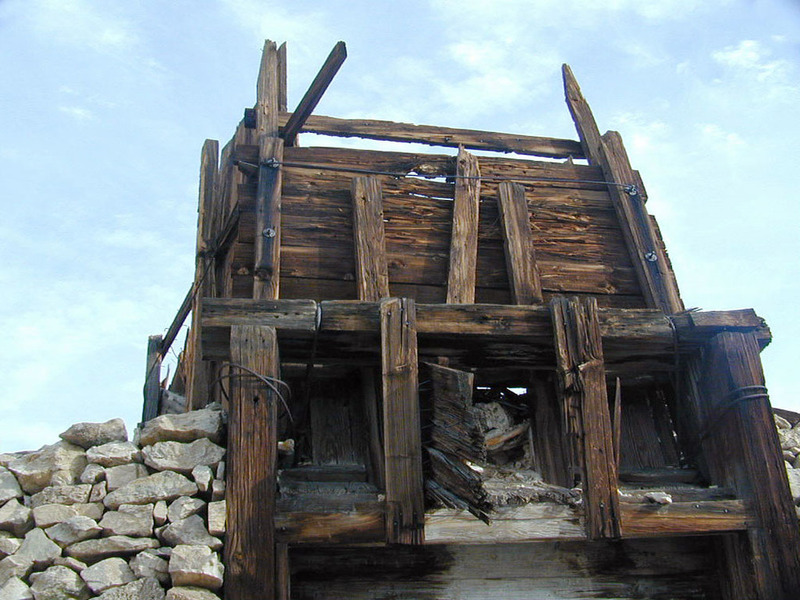 An ore chute positioned to dump ore into a mine cart. The tracks ran just below this chute.A buried train car can only hold our interest for a finite period of time. We wanted to find a non-buried train or something a little more interested. We didn't have to travel far. Only a few miles down the road we discover a mine. Following down the mine cart tracks. The retaining wall is in remarkable condition.This wasn't a hole-in-the-ground kind of mine. It was "glory hole" type mine. The minerals were at the surface and could be mined directly without the need to tunnel. 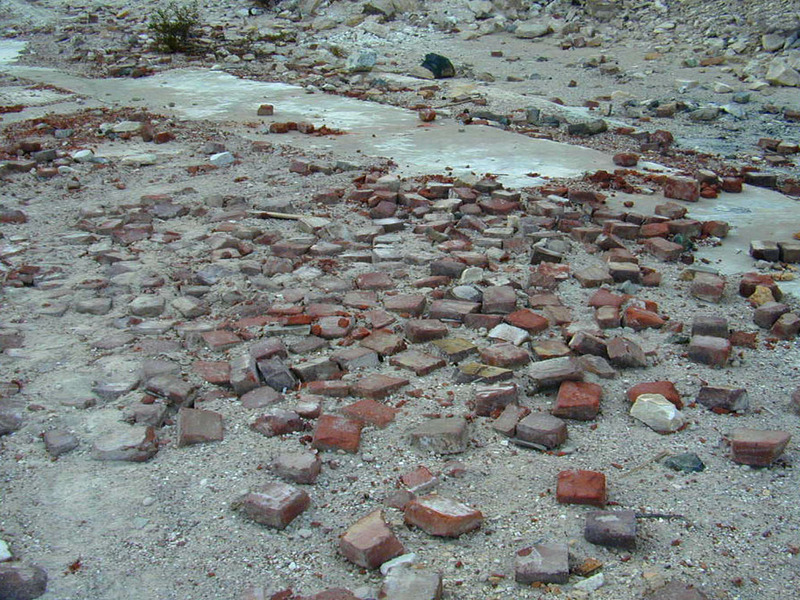 The remains of this mine were largely intact. 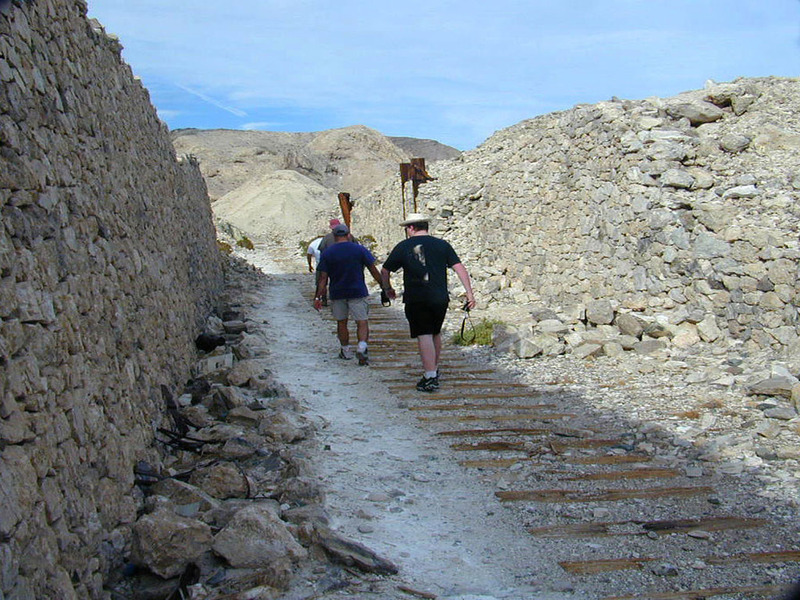 Ore chutes, retaining walls, and mine cart tracks were in remarkable condition. Ned practices for the circus.In addition to the expected mine paraphernalia, there was a Volkswagen bus, a computer (yes, a computer), and a circus rolling wheel. Actually, it wasn't a circus rolling wheel, but Ned thought it was. He balanced on it and rolled around for a bit. Fortunately, he was not injured. A cairn of railroad spikes.Exploring the area further revealed tailings, bricks, concrete, and evidence that Vince was a here. There were some interesting plants growing near the mine. Of particular note was some desert holly and a bonsai tree. The most encouraging thing discovered was a cairn. Cairns are harbingers of discovery. This cairn was made of railroad spikes which indicated a railroad discovery would soon be made. We were not disappointed. Mike hops on board the train and invites anyone to join in a joy ride. Mike and Hector release the brake and wave goodbye to everyone. The wheel is connected by way of gears to something underneath the car. The railroad equivalent of a childproof safety cap. We were defeated. No train ride for us. The airbrake release handle. A small pull makes a very loud noise. The train connection knuckles were an enigma. Here is Matt "liberating" a piece of the train. 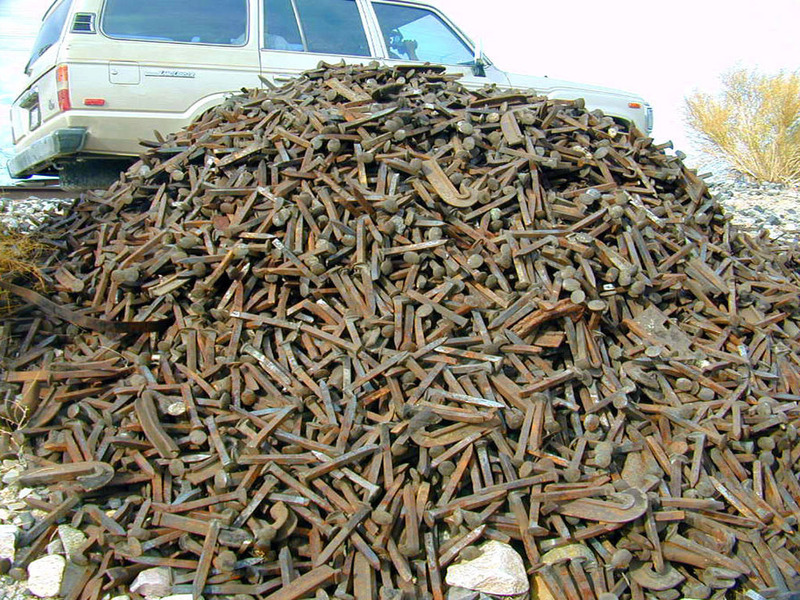 A cairn of railroad spikes. Thick and black oil. Yuk. Near the mine was a train. Yes, a real train. It consisted of eight or nine cars although it didn't have an attached engine. Time to do some investigating. Mike jumped on the lead car and released the brake. Expectations were somewhat dashed when the train failed to begin moving. Examination of the brake release mechanism revealed no discernable malfunction. Another tactic was needed. Maybe the other connected cars are preventing the train from moving. If only we could detach the end car from the rest. The car release mechanism was a little puzzling. Eventually we figured it out, but the cars would still not move. Drats. It was then that Amy discovered the air brakes. You just pull a little hidden handle and HISSSSS! the brakes would let off air pressure. The effect was rather startling. Still, however, the train failed to move. Our plans were ultimately defeated when it was discovered that the tracks had a safety lock to prevent the train from moving. A train ride was not possible, but we could still do a train climb. And climb we did. All over that train we climbed. We were careful though. The train warned us to be. Matt decided to loot the train. After much pulling and yanking he settled for hook thingy connected to a piece of chain. Connected to the other end of the train was a boxcar. This one was decorated with urban art. Near the train was metal bits, oil, cans (naturally), and even some spilled wheat. The map of the area revealed more areas of interest farther down the tracks. Off we go. This tank sports a hook/spike/gouger weapon. This tank is wielding rotating buzz saw blades of death. After endless miles of following the tracks we come to a spot that the map indicates is Kelso. We must have made some miscalculation because all we could see were a few pieces of machinery (tank-like) looked suspicious. One machine was wielding a rotating disk of buzz saw blades of death. Another machine was wielding a long claw/spike/gouger weapon. We later found out that this area wasn't even near Kelso. We misread where we were on the map we had. Hector slides down a sand dune. The Kelso dunes. The sand isn't really tan, it just looks that way in this photo. It was actually more of a light gray. A short distance beyond the mysterious combat vehicles we discover the Kelso dunes. These sand dunes are a mixture of sand an rock. This extraordinary dune system has an unexpectedly mysterious history. Huge amounts of sand were needed to build Kelso’s delicate wind-created sculptures, but geologists studying the Preserve discovered that no new sand is moving in to replenish the dunes. Where did the sand originally come from? What made it stop accumulating? Mike and Amy sneak a smooch. 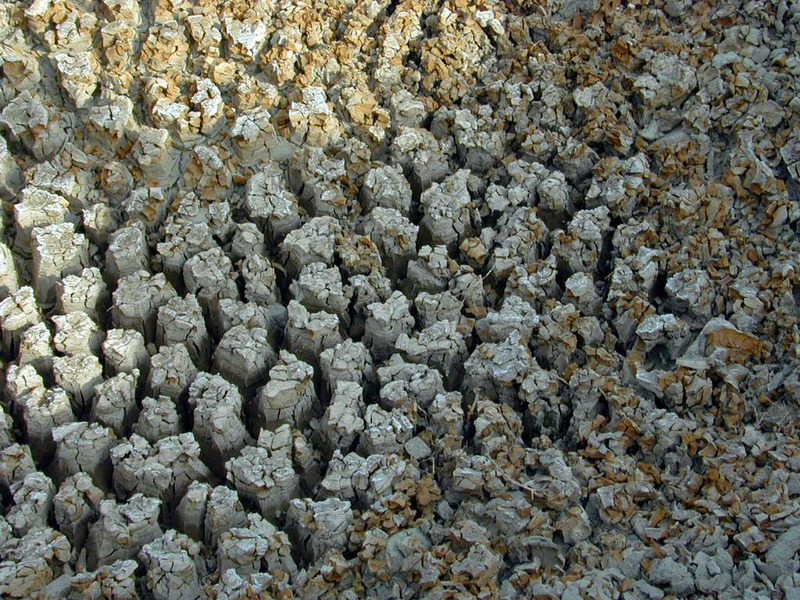 A sand pit (a.k.a., Sarlac pit) is discovered by an outcropping of rock. Matt climbs on rocks that overlook the dunes. Ted returns some unwanted sand. The sun is getting low so it is time to return the vehicles. In spite of all this time that we were by the railroad tracks, we had yet to see a train. Our disappointment was about to end. A light started to flash up the track a ways. Colin informed us of the significance of this light. There is a pattern of color and flashing to indicate the nearness and direction of trains. This light indicated that a train was approaching. As it turned out, Colin was correct. A train rushed by us at amazing speed. It was quite a sight! The return trip occurred in darkness. I could tell about how we learned that a mere two inches on the map can actually be hundreds of miles, or tell about how we were a bit slow to realize we were headed in the wrong direction, or even tell about how Ted zoomed miles ahead of the rest of the group. Instead, I'll just eave you with some majestic sunset photos.